One of the most famous TV stories is the one about a lovely lady, her three very lovely girls, and a man named Brady with three boys of his own. This is of course the theme song to The Brady Bunch, Sherwood Schwartz’s idea of a modern blended family. Robert Reed and Florence Henderson play the perfect parents, and Barry Williams, Christopher Knight, Mike Lookinland, Maureen McCormick, Eve Plumb, and Susan Olsen are their rambunctious and too-good-to-be-real kids. Rounding out the clan is Ann B. Davis as their lovable housekeeper. The TV show became even more popular in reruns and has taken its share of flak for its storylines. 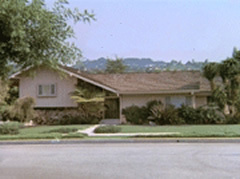 The one star not mentioned or seen in the Brady Bunch opening theme is the Brady house. It was however shown in every one of the sitcom’s episodes and sported a modern look that viewers of that era desired. The structure also featured a separate shared bathroom for the kids and a home office for Mr. Brady, an architect. In the exterior scenes of the home, producers wanted to show a middle class house that would seem well-suited for an architect, yet would look affluent enough to require a housekeeper.